For most travellers, Tuscany is Florence, Siena and maybe Pisa, because everyone needs to see the Leaning Tower once and just once. But the region is so much more than the sum of these three cities. In the deep south, thousands of locals have coasted through the centuries blissfully ignored by tourists. They call the Maremma home. A folk story name for a section of Tuscany that has been ruled by a hundred different rulers over a history that has included Turkish pirate invaders and a whole lot of malaria. The Maremma covers roughly a quarter of Tuscany. It’s a vast expanse of extremely proud and extremely independent towns, each of which is its own little world where the ingredients in their acquacotta soup (a local vegetable soup) differ along with the dialect they speak and the stories they tell their children. And all of this in a very picturesque surrounding. Endless stretches of magnificent countryside and a terrain that changes from snow-capped mountain to soft sandy beach, with the obligatory sunflower-filled field in between, in a handful of kilometres. The ‘capital’ of the Maremma is Grosseto and it’s about three hours from Florence on the border with Lazio. Public transport is sporadic, so the best way to explore is by car. A day trip in the territory is about experiencing the best of the season. With spring well and truly here, give the museums a skip and see the area’s incredible heritage of nature parks and open-air attractions before it gets too hot. A shared history and misfortune is probably the only tenuous link connecting the towns and cities of the Maremma. The name likely comes from the Latin maritima, and while there’s plenty of prehistoric history, the area’s first architects were the Etruscans, an extremely cultured and sophisticated pre-Roman civilisation of pretty crummy warriors. You can imagine what happened when the Romans arrived. Today the Etruscans have left their mark all over the Maremma. One of the most spectacular sites in Sorano’s Citta del Tufo - a vast archaeological park located in a forest of oaks and chestnuts. 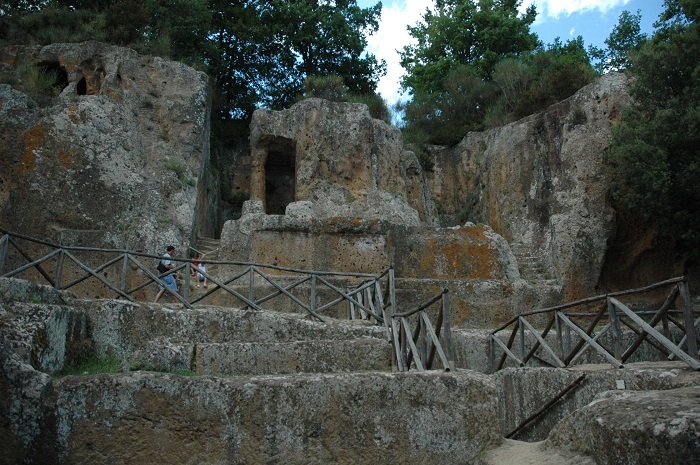 The site is a necropolis with a handful of 3rd and 2nd century BC tombs including the incredible temple-like Tomba Ildebranda, which still has some of its bright red and yellow paint. The tombs are scattered throughout the forest so you don’t so much feel like a museum visitor as an amateur archaeologist discovering hidden treasures. After the Romans, the illustrious figures of Italian history gave the Maremma wide berth. For more than 500 years, the area was infected with malaria. Dante Alighieri scorned it the Divine Comedy and the locals became synonymous with lawlessness and poverty. Even today, ‘Maremma maiala’ is a popular Italian curse word used when something bad happens. And yet, modern Maremmani have malaria to thank for their heritage, culture and landscape. The pestilence hardened the locals, shaped their legends, defined their cuisine and protected their towns and landscape from developers and tourist invasions. From Sorano’s archaeological park, head 50km and more than 2,000 years forward in history to Capalbio’s Giardino dei Tarocchi. This contemporary art garden is closed in winter, but reopens in April each year. Inside hundreds and thousands of mosaic squares were cut and shaped by French-American artist Niki de Saint Phalle over two decades. The mosaics decorate her depiction of the 22 tarot cards. 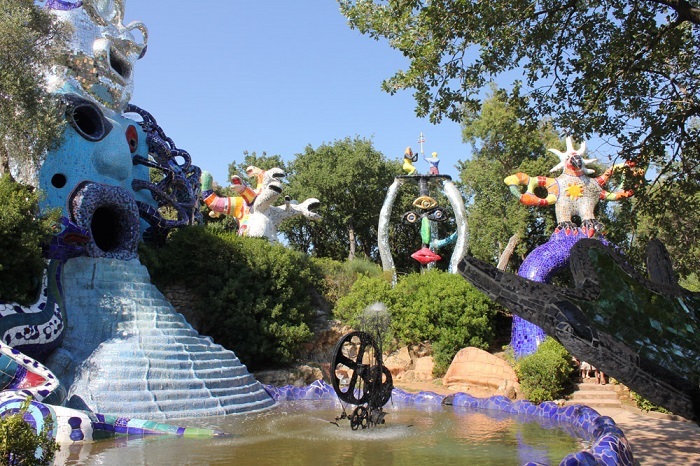 The sculptures are bright, big and beautifully made. Some are built with hidden rooms and castle turrets, making for a fun afternoon of discovery for the whole family. 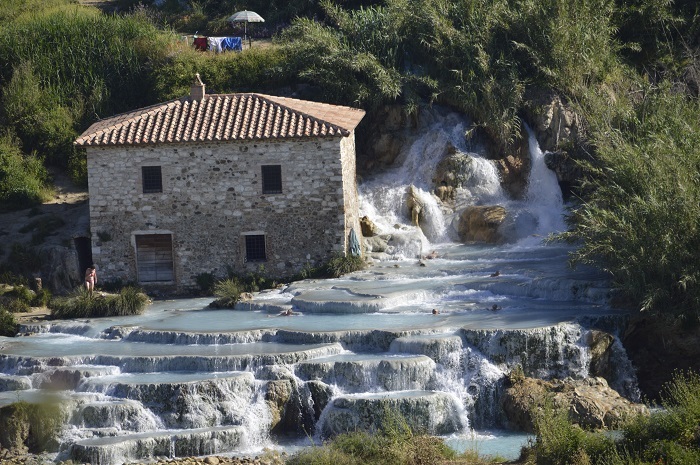 After a dusty, but delightful tramp through the gardens, visit Saturnia’s hot springs. On the way, keep an eye out for the wild asparagus that grow alongside the road. Collecting them is a favourite local spring activity. The Etruscans and Romans first discovered Saturnia’s hot springs. They swam in big stone tubs, but modern-day travellers can choose to experience the 37°C waters either at the elegant spa centre (entry €25) or the Cascate del Mulino, a free open-air waterfall where the water tumbles into naturally carved travertine pools. End your Maremman day trip with a visit to a local winery. The Maremma is famous for its DOCG Morellino di Scansano, a red wine similar to Chianti, but a little rougher around the edges. It’s the embodiment of the locals, who are also a little more gauche than their Northern Tuscan cousins. The best vineyards are located in Scansano, the birthplace of the Morellino, and neighbouring Magliano in Toscana, both only 40 minutes from Saturnia. Wine tasting in the area is almost always accompanied by local cold cuts and cheese. The Maremmani have a thing for cinghiale (wild boar), so don’t be surprised to see it on the menu in salami form. ·Tradizionale Canto del Maggio: Boccheggiano celebrates May 1 with traditional songs and folk stories. ·La Notte dei Pirati: Porto Ercole is transformed into a pirate’s cove for one weekend of family-friendly plundering and treasure hunting at the start of May.